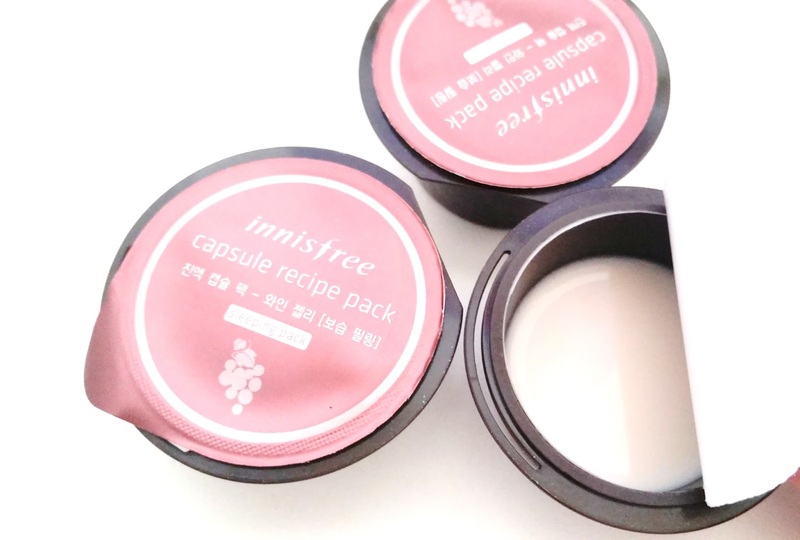 Today I am going to review the last Innisfree Capsule Recipe Pack Sleeping Packs, the Wine Sleeping Pack. 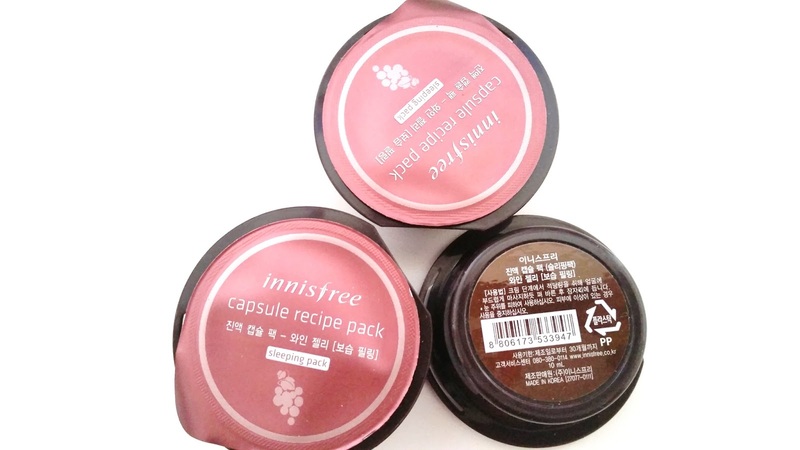 Innisfree has 2 lines of Capsule Recipe Packs, wash-offs and sleeping packs. There are 5 sleeping packs, although 2 have been out of stock for a while and I'm unsure if they are being discontinued or not. This Wine Sleeping Pack is one of the 2 that is currently out of stock. I do know that Innisfree has a larger version of this, so maybe that has something to do with this one being out of stock. Anyways, let's get to know this Capsule Recipe Pack! Product Description: A hydrating sleeping pack formulated with wine extracts to nourish and condition the skin while you sleep. Its formula is easy to absorb and creates a protective moisture barrier on the skin. This sleeping pack can also keep the skin supple and firm. To Use: Use this sleeping pack as the last step of your skincare routine. Take a good amount and apply it to the face. Wash off with lukewarm water in the morning. Ingredients: Water, butylene glycol, squalane, cyclopentasiloxane, dimethicone, PEG-240/HDI copolymer bis-decyltetradeceth-20 ether, wine extract, camellia sinensis leaf extract, citrus unshiu peel extract, opuntia coccinellifera fruit extract, orchid, camellia japonica leaf extract, cetearyl alcohol, C12-16 alcohols, dimethicone/vinyl dimethicone crosspolymer, polysorbate 60, cetearyl glucoside, hydrogenated lecithin, palmitic acid, glyceryl caprylate, xanthan gum, disodium EDTA, phenoxyethanol, ethylhexylglycerin, fragrance. 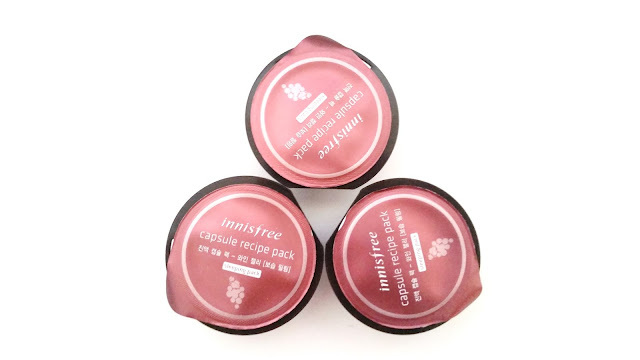 Packaging: Like all Capsule Recipe Packs, this Wine Sleeping Pack comes in a small black-brown container with a peel off lid. The lid features a picture of the sleeping pack's featured ingredient (wine) and also its name. It also has the words sleeping pack on it. The main color theme for this sleeping pack is wine color. As always, there's a bit of information on the back of the package, but not much. Scent: I was pleasantly surprised by the scent of this sleeping pack. I expected wine (really) and while it's got a hint of wine, it smells more like grape juice. It's pretty decent actually. Color: This sleeping pack is milky pink in color but more leaning to the milky side. Texture: I thought the texture of this sleeping pack is really fun. It's like memory foam style, in that the sleeping pack returns to its shape after a while. So, even if you scoop out some it'll fill back the hole afterwards. 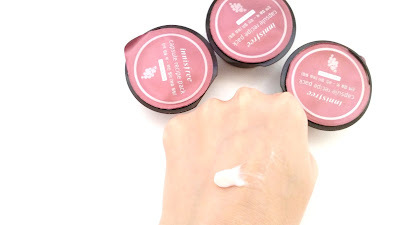 The sleeping mask feels a bit jelly like at first, however when you apply it on the skin it turns creamy and watery. My Thoughts: During my patch tests I thought I was going to fall in love with this sleeping pack but then I started the full face test. Prior to the full face test everything was fine and wonderful, to be honest, but the full face test revealed something I didn't expect. No, it didn't break me out (thank goodness) and it didn't cause irritations either. So what was it? Well, the mask provides this rather unpleasant tightness feeling on the skin. It feels like you left your clay mask on for too long and it became super dry on your face and super tight too. I did not expect the tight feeling and I was a bit taken aback by it at first. I worried that it would dry out my face too, but surprisingly it didn't. It was tight but moisturizing, odd huh? But then I wondered if this tightness has anything to do with the mask's promise of making the skin supple and firm. I can't confirm or deny that but I can say the mask did make my skin feel supple and firm in the morning. I like that the sleeping pack absorbs super quickly and it doesn't leave any sticky residues behind. It makes the skin feels soft, which is nice. It also works over night to make the skin feel supple and firm in the morning. The mask doesn't make my skin feel greasy in the morning and it didn't cause my skin to produce any excess sebum on my T-zone area either. The one thing to note about this and all the other Capsule Recipe Packs is that their resealing technology (the insert flap into slit part) is not so great. It would be best to use a different lid or a small object on top of the sleeping pack to keep the lid closed. Final Thoughts: I can't say I love this sleeping pack but I do like it. The tightness feeling I can do without but everything else it offers is wonderful. I've started to section my sleeping packs, in that I apply different sleeping packs to different areas of my face. Since I do have combo to oily skin, this will help me to target different issues on different areas of my skin. 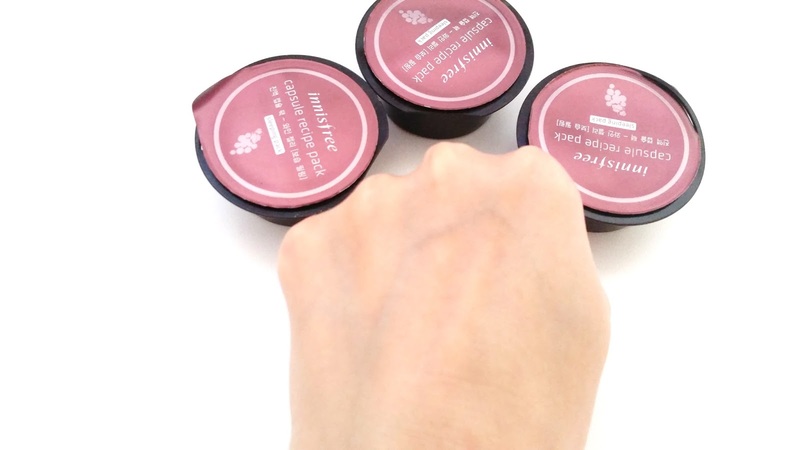 This Capsule Recipe Pack Wine Sleeping Pack would be great for my cheeks and maybe for my forehead. I can share a post on multi-masking and the sections if anyone's interested (let me know in the comments below)! Would I repurchase this in the future? I would, but this is currently out of stock and I am unsure if Innisfree will be restocking this in the future. Do I think this is worth a try? If Innisfree restocks it, then yes. Especially if you are looking for a sleeping pack that can provide suppleness and firmness to the skin.